1987 Pierce Dash sold in less than two weeks! 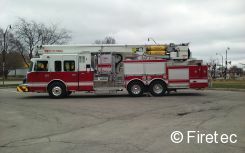 Congratulations to the Berkshire Fire District/Johnstown FD on the purchase of this 2007 Seagrave! 1992 Spartan which may be turned into a 911 Memorial Unit. Thank you to Jeff Clark for trusting the Fire Truck Ladies to find a buyer for this 2009 ALF! 1991 GMC 4x4 now in service in Maine after having served at the upper end of the Blue Ridge Mountains! Many thanks for counting on The Fire Truck Ladies to move your 2011 T-Rex! Thanks to Commissioner Dave Knapp for trusting the Fire Truck Ladies once again!